You've got to work hard to keep the rust away when it comes to life drawing. I had done nothing at all over the Christmas and New Year holiday so got some 'life poses' up on the computer and did some practicing before the real sessions started up again. I'm a big fan of Susan Lyon so am trying to use her methods for some of my life sessions where we have the dramatic lighting that many artists so love. This is definately a direction that suits my personal aesthetic and fits in with all that I like about Odd Nerdrum, Georges Suerat, Rembrant, Caravaggio and Leonardo amongst others. Chiaroscuro - In art the modelling of volume using light and shade in strong contrast to depict form. This coming year I shall be working on simpliflication. Trying to reduce what I am seeing to the essentials and fighting off the compulsion put everything in. Its all about decision making and doing it on the fly isnt always easy but I think its the way forward. Also Susan speaks of a light touch, something I have been aware of for a while but really need to put into practice as a matter of course, start slow and light, and build up gradually - slow down to speed up so to speak. Sketchbook Pastel on Rives BFK - still playing with this one. I did it from the sketch at the top of this post which I have discovered is a very useful way of testing out if you are getting the important information into your sketches. Simplification isnt just about leaving things out, its making sure you put the essential bits in and with accuracy. If you can make another piece of artwork from a sketch that looks good you are on the right track. In this instance I misrecorded or re-interpreted her leg length which was immediately apparent when I went back to the photo, so I was able to correct it but of course couldnt have done if it had been from a life. Lifeclass 20 mins - I was pleased with this at the time but there are some niggles I see now. Lifeclass 20 mins - someone said this reminded them of the Marat pose (Google Jaques Louis David, Death of Marat) - I would have liked the forward facing position although this still has something about it. 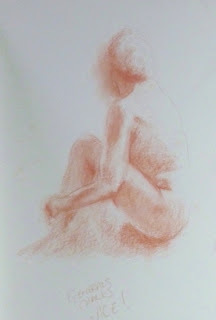 Lifeclass 2 hours approx pastel on Rives BFK - unfinished. I had to make up the 'dramatic' lighting as it was daylight. I'm thinking its lacking crocodiles or something interesting in the foreground too! Maybe I'll do something with it, or maybe it'll just get shoved in the pile. A different life group with the dramatic lighting, unfortunately we had a power cut half way through this one so the flow and the light was completely interrupted - it was of course on track to be the best piece I have ever done - ha! Seriously though I really liked this pose and the model was superb, it was her first time and she was a statue. Weekly painting class, waht was supposed to be a quick preliminary sketch on really cheapo paper that turned into about an hours pose, I'll be moving on to the same pose in colour next week - the poor girl had the most awful flu, it was supposed to be a full figure pose but she was suffering enough without having to take her clothes off too. So a good start to the new year all in all although the 'draw every day' resolution has gone by the wayside already. Looking forward to doing a painting soon too. Thanks for dropping by.